This particular publication is not what it might seem at first glance. One could get the impression that it is an account of Ukrainian partisan activity and actions behind German lines on the Eastern Front during World War II. One would be mistaken. Author Alexander Gogun has written an account of the formation, organization, composition, leadership, and personnel of these partisans units in addition to their internal conflicts, logistics, and disciplinary problems. As well, one might get the idea that all partisan detachments were composed of those militarily untrained and non-uniformed civilians (men and women), escaped prisoners of war and Soviet soldiers who avoided capture during the multiple encirclements of Red Army units in the early actions of Operation Barbarossa, left or caught behind enemy lines as a result. Again, one would be mistaken as many of these uniformed partisan operatives were deliberately infiltrated through the front lines or were parachuted into the Germans’ rear along with ammunition and other supplies (although much of their logistical resources were taken from the Germans, supplied by local residents or confiscated from collaborators) after having received their orders from Moscow. The first two chapters and their sub-sections cover the development, organization, leadership, and chain of command in partisan detachments from 1941–1944 as well as an overview of Soviet partisan warfare in Ukraine over that period. 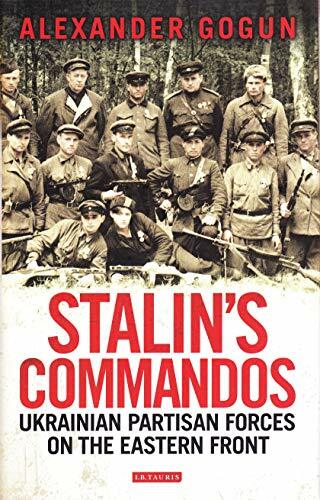 The author covers the role of the Soviet High Command in directing the partisans and the evolution of their war during those three years. Each of the remaining five chapters describes the formation, organization, personnel, etc. mentioned above and is also sub-divided into sections that cover topics relevant to that heading. For example, the sections of the chapter of main partisan activities list those actions taken against the German occupiers such as the destruction of economic targets, communications sabotage, terror, intelligence gathering, and propaganda. Respective sections under the other chapters include the recruitment, social structure, numerical strength, ethnic composition, problems of supply, retaliation by the Germans provoked by their activities, disciplinary problems, and the conflicts within and between partisan detachments. The conclusion notes the many characteristics of Stalin’s partisan war, reasoning that it was not just a matter of fighting and defeating the fascist occupiers. It was also necessary to weed out and eliminate Ukrainian, Polish, and other nationalists as well as enforce the proper attitude and loyalty within partisan units and the civilian population in occupied territory toward Stalin, the Communist Party, and the Soviet Motherland and belief in ultimate victory. Besides the requisite notes, bibliography, and index, the author has also creditably included multiple maps, diagrams, and tables that provide additional data and context. The photographic section is primarily composed of portraits of many of the leading partisan commanders and their men as well as two surviving partisans the author interviewed in his research. One other included necessity is a two-page list of abbreviations or acronyms. Considering the number of these employed, the text sometimes gets rather cluttered with them, but then it is helpful to be able to consult the list in order to understand to which agency or organization the author is referring. If there is any criticism to be made, it could be that the use of commandos in the title is a bit of a misnomer for those of us in the West. As a rule, a commando is one who is specifically schooled and trained in special forces operations over and above any conventional military training received, as in SEALs, Rangers, and Green Berets. Many of the partisans did not have, only later received,, training or relied on a specific trained individual from Moscow for the skills necessary to successfully accomplish sabotage and other destructive acts committed by these irregular forces. Also, the text occasionally reads as if the author has gotten somewhat off the organizational track or perhaps train of thought in terms of the point that is being made. It would appear that this is probably a result of an Eastern or Central European style of writing as much of Gogun’s credentials and previous research seem to indicate such a bent. In any event, this is an informative book that adds much to a relatively unknown, largely neglected, and somewhat shadowy subject. That it is now seeing more of the light of day can only be a good thing for the corpus of World War II literature.